I promised a final update on my season off and here it is. I completed the Devizes to Westminster kayaking marathon on Easter Sunday morning. My crew mate, Julien, and I came 33rd out of 115 starters, covering the 125 miles in 24 hours and 34 minutes. We had hoped to go sub 24 hours but were still very happy with the result. I have written a detailed report over on Paddle Log for anyone interested in all the gory details. The season is over but I will now be back on topic and, I hope, back on the snow for 06/07. In fact, all the endurance training of the last few months has given me a new interest: cross country skiing. Roll on the winter. As explained in the previous post my energies are away from the snow this season but I thought I would provide an update here and, if anyone is still reading, ask you to consider helping by sponsoring us. The 125 mile non-stop Devizes to Westminster International Canoe Race is now less than two weeks away and our training is almost over, having completed the last of the build up races yesterday. There is a race report and some photos along with the entire training diary over on Paddle Log. Now we are looking for sponsorship. We are raising money for Shadwell Basin, an outdoor activity centre in Tower Hamlets, East London. This is one of the most deprived boroughs in the city and 'The Basin' provides fantastic opportunities for inner city kids to get out and try water sports like kayaking and sailing. So, please consider supporting them by sponsoring us, which you can do through our sponsorship page. Many thanks. I will post another update after the race itself and after that I will be back on topic. Snowgo has been very quiet lately and it is likely to stay that way for the rest of the season. I have decided to sacrifice snowboarding this season to try and fulfil a long held ambition, to paddle the Devizes to Westminster Canoe Race. The commitment involved means I will not have time for snowboarding and my blogging energy is currently focused on www.paddlelog.com, where I will be recording my progress. "The Sounds of Your Experience"
Congratulations to Nick on getting his poem "The Sounds of Your Experience" published. So subtle, yet so reminiscent of strapping in and riding away from the lift in anticipation of the run - I can hear it now. This is a little off topic but I have been playing with the social software application building "playground", Ning. Its great fun and an easy way to test out ideas for social applications, so here is one I made earlier that may be of interest: Window Seat. Have you ever wondered which side of the plane to sit on for a great view of, say, Mont Blanc when flying into Geneva? Tthe idea behind this application is to share that information and tag it with a 3 letter airport code and 'left' or 'right'. You can quickly check out which side to sit on by looking up an airport or offer your own advice on the best window seat. I just discovered via Ben Saunders that it is possible to try out rollerskiing very close to home. I have seen people doing this on the back roads of New England as summer training for cross country skiing and always thought it looked like fun. Now I have a chance to try it out. Sam, aka The Funky Drummer, is launching a new ski writing magazine, Snow Sphere, and is looking for writers. Aspect Journal, my favourite ski literature site (are there any others? ), has just posted an update and a new writing competition: ski sounds, deadline 31 October. I can think of so many evocative snowboarding sounds that I might just have a crack at it. For some at least, just received a link to this 'first turns' report in my inbox and something within me has reawoken. Ben Saunders has launched his ambitious South expedition. Setting out from Scott's wooden hut on the edge of Antarctica, we will manhaul 400lb sledges across 1,800 miles of the most hostile terrain on earth, to the Pole and back. SOUTH is the four-month trek, the first ever South Pole round trip on foot. We will have no outside assistance, no air resupplies and will ski every mile under our own motive power. Reading about the expedition on Ben's blog I was immediately captivated by the idea of seeking sponsorship from individuals. I can, to some extent, share the dream of making an epic expedition like this but I know I'll never do it. Sponsoring Ben and Tony is my small way of helping to allow this sort of thing to happen and, in the process, raising the human spirit. Good luck guys and I look forward to following your progress. Not an airport transfer but today's stage in the Tour de France! 192.5 km and a staggering 3,257 m of climbing. They should be starting about now and finishing in around 5 hours, only about twice as long as a coach transfer. 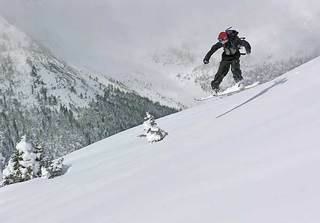 There is a good article up on Endless Winter about working with the Loveland Volunteer Ski Patrol. I particularly liked the info and pictures describing the use of an "Alpine Toboggan" (aka blood wagon) with a snowboard rather than skis.